JazzWrap revisits a great year of discoveries in 2011. Jakob Bro's presence has been raising in recent years. His last release Balladeering, gained critical acclaim along with prior recordings with Tomasz Stanko. Balladeering was a masterful work that featured Konitz, Frisell and the late Paul Motian. That recording was a monumental step in Bro's career as leader. On his latest, Time (Loveland Records), Bro keeps the quartet setting but sans a drummer. This makes for an even more intimate affair. With Time, Jakob Bro has written material that is even more deep and personal than the excellent predecessor. Here Konitz and Morgan mingle and create some magnificent colours. The paring of two guitar is just as intriguing as it was on Balladeering. Bro shapes the harmonics and soundscapes while Frisell adds the linear passages to pieces. "Cirkler" is a beautiful number in which Konitz and Morgan provide a calming tone surrounded by mood setting atmospherics from Bro and gentle Americana acoustics of Frisell. Bro's writing has matured and become rich with various textures and sonic layers than even Balladeering displayed. "Swimmer" is a lonely journey down the motorway. It's a quiet and deeply melodic tone that Bro sets forth but not in a depressing way. It's more a matter of being at piece with ones self. You can sense there's more intimacy on Time. The musicians feel more affected by each other. They have all played together in various forms over the years so they is great chemistry. "Fiordlands" is another bright moment where Bro's writing is uplifting like a Sunday morning church call. It's bluesy but with close sense of joy that quickly takes hold a few minutes in. Konitz and Bro both wrap this piece like chocolate and caramel. The closing number "Smaa Dyr" is more of a trio (without Konitz) and it's a beautiful way to close out the album. Just as "Fiordlands" its somber in tone but you can feel the uplifting tone that rising as the piece moves further along. I fell in love with Time minutes after it finished. Jakob Bro has circled himself with great musicians who effortless craft his material into something special. With Time, Jakob Bro should be on the radar of many jazz fans in 2012. He has grown as a leader, composer and performer. The pieces on this session has stuck with in short time of its release in November. That's why I have named Time as my album of year. Highly Recommended. 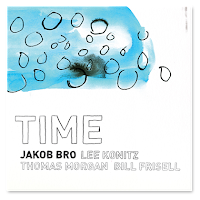 JazzWrap was honoured to have another opportunity to discuss recording Time with Jakob Bro recently. Here's a bit of that discussion. 1) Since the acclaim of Balladeering how has your recording process changed? Time is done pretty much the same way as Balladeering…I composed the songs in August - went to a small cottage by the sea in Denmark and just wrote music for one week straight. Two weeks later I went to New York and met up with Lee, Bill and Thomas at Avatar Studio A…we started playing the songs around 11AM and played pretty much without stopping for two hours…most of the songs are first takes (as with Balladeering)…it was a beautiful experience for which I feel very grateful. 2) There's more intimacy with Time without a drummer. Was that on purpose? Yes! I love Balladeering so much and it didn't feel right to me to go in and do the exact same thing again…so I changed the line up. I love Thomas' playing - On "Balladeering" Lee is featured a lot - on "Time" I wanted to feature both Lee and Thomas at the same time and I thought it would be really cool to do so in a very transparent setting without drums. We also recorded "Time" in a different way than Balladeering. All in the same room - sitting in a closed circle without headphones. That in itself is very intimate - you can't change a note once you've played it and you can hear even the slightest sound coming from each other. It was truly a great way to record and James Farber is so incredibly masterful at capturing the moment like that sound wise. 3) Working with Bill Frisell and Lee Konitz again must have made the recording feel like home? Well, working with Bill, Lee and Thomas makes me feel honored and very very humble. They all play absolutely incredible on this record and I can't even describe in words how happy I am that they all agreed to join this session and play my songs. 4) Will you be touring for this record? I'm touring more and more with my own music. Both in a trio setting and sometimes trio with a soloist…also I have been working with my nonet a bit. I do the same songs as on my recordings but of course they sound different depending on the line up. I'm not going to tour with the original line up from Time. I might do one or two shows if logistics happen to match but nothing is scheduled at the moment. I have some trio gigs lined up for my Danish trio next year, 5 gigs with Jeff Ballard on drums also and in the fall I have a 2 week tour with Thomas Morgan and a drummer.